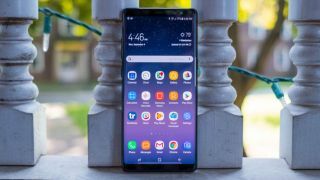 Leaks have shown us a lot of what the Samsung Galaxy Note 9 will be able to do and what it will look like, but today is the first time we've spotted the phone in a hands on video. Shot by UK phone accessory retailer Mobile Fun, the hands on video of what looks to be the upcoming Galaxy Note 9 shows the phone off from all angles. Sadly the screen doesn't turn on in the video below, but the source claims it is a real device. We can't attest to whether the handset in the video is real, but Mobile Fun says it got the device through "extensive contacts in China". The video seems to show a premium device that looks near final rather than a dummy unit or a knock-off imitation. The video shows the Galaxy Note 9 will have a remarkably similar design to the Galaxy Note 8, but the phone does have thinner bezels than the last generation as well as a different looking. As shown in previous leaks, there's a dual sensor camera on the rear with a flash and a few other pieces of tech, while the fingerprint sensor will sit below the camera tech rather than next to it on as it was on the Galaxy Note 8. That's down to criticism of the fingerprint sensor being too close and easy to mistake for the camera, which often ends in some photography through a smudgy lens. You can see the phone in the flesh in some hastily filmed video below, but remember we're going to see all soon with August 9 the date for the official launch in New York so it won't be long until we see the device officially announced by Samsung.